When people give a thought to automating Active Directory, the first thing on their mind is to be able to automate user creation / provisioning without any loopholes. Since PowerShell / scripts only entangle you in more complexity, choosing a good Active Directory automation software that offers a well-planned automated user provisioning system is a must and it is like walking a tightrope between thoroughness of software provision and cost factor. Striking a balance between these two decisive factors, ADManager Plus offers one of the sound automated user provisioning systems in this industry. Before you grow tired of the marketing psychobabble, let us allow the software and its features to speak for themselves. Automating user provisioning is not just about a batch file running at a scheduled time, churning out hundreds or thousands of user accounts. It's beyond that. Take a look at the following table for more info. Approval workflow system allows you to build a linear hierarchy of process approval for the automation. That is, you can specify who configures and initiates the automated process, who reviews the process, and who approves it. In other words, it helps you introduce supervision breaks at crucial junctions of the automated process. Why this feature is important? User provisioning automation is a crucial activity and it is not wise to leave it unmanned. Moreover, several IT regulatory laws mandate a supervision system to overlook and document all crucial activities such as user provisioning/ de-provisioning. With this naming format, you can tag along names or email addresses with a unique identifier (as specified by you) in order to avoid any duplication. Usually, in a bulk user provisioning process, naming attribute duplication is a common problem. ADManager Plus conveniently avoids this issue with the help of its "advanced naming format". It's a namer widget, whose job is to name the user accounts and its properties. You can configure it to improvise names with whatever data is supplied to it. Why this features is important? Perhaps, the most common reason for several unsuccessful user creation/ provisioning runs in automated user provisioning system is the missing fields of the CSV file. It's the most important of them all!! ADManager Plus allows you to crystallize user provisioning. You can save all the configurations of user account properties and mailboxes in a template and apply it to user accounts when they are created! Why this feature is so important? User provisioning is labor-intensive, so a shortcut like this does a world of good in terms of time and effort saved. Besides, every configuration needed for a user account can be done from one single window! set the execution time for this Automation. fill in the path where the CSV file would be stored. select a user creation template to be applied. depending on your necessity you can choose whether to implement the workflow or not. Now, the process kick-starts whenever a new or updated CSV file is discovered by the Automation during its scheduled run.It either completes the creation and just notifies the concerned or in case of controlled-automation(buisness workflow implemented automation)it yields a neat report of user accounts to be created and wait for the reviewer (as defined in the implemented Workflow), who will only have to raise a finger to push the button after perusing the request. 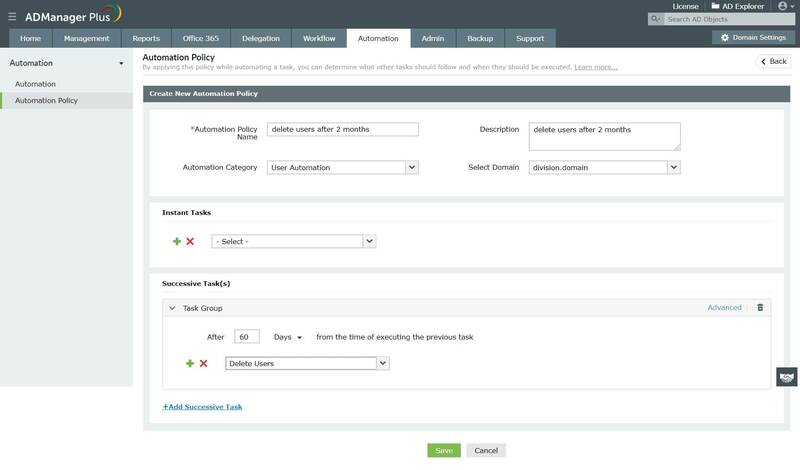 ADManager Plus automated user provisioning is so simple and foolproof (as you can always propel the process through the workflow making sure the task is double-checked at each phase) that even the non-technical HR personnel can be delegated the task of user account provisioning.